Cact. Succ. J. (Los Angeles) 51: 278 1979. LAU1244ASierra de la Paila, Coahuila, Mexico 1600-2200m The flowers last briefly, they are fully expanded at high noon (if in brilliant sunlight), and wilt after only an hour or two. They bloom from April through August. Origin and Habitat: Mexico, Coahuila, Sierra de la Paila. Altitude range: 1600-2200 metres above sea level. Type locality: Mexico, Coahuila, 48 km N of El Marte, 2000-2200 metres, a railway station on the railroad parallel to route 40, the Saltillo-Torreon road. Habitat and ecology: Coryphantha pseudoechinus subsp. laui grows on hilltops with limestone gravel and rocks. 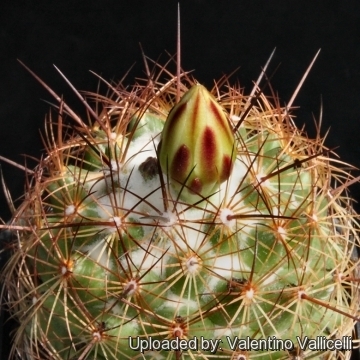 Description: Coryphantha pseudoechinus subsp. 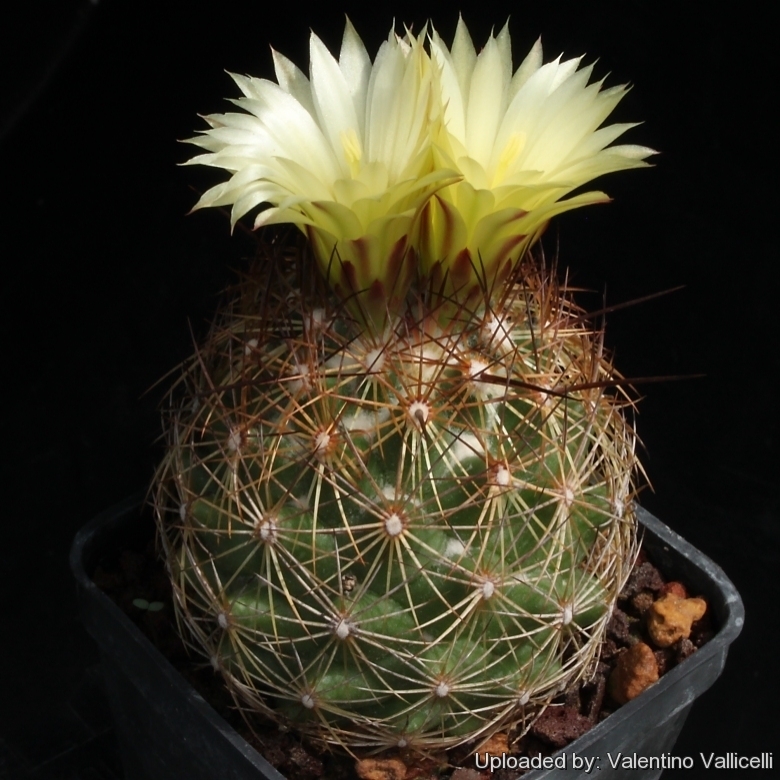 laui (Bremer) Dicht & A. Liithy is very similar to the standard Coryphantha echinus, with the exception of yellow flowers and slightly different skin and spination colour. Stem: Solitary or group-forming, globose to ovoid, apex slightly depressed, white woolly, 5.5 cm across and up to 5 cm tall, grass-green. Tubercles: Conical, somewhat flattened on the upper side, up to 13 mm long, with narrow groove on upper surface, sometimes with yellowish glands near the areoles. Axils woolly in youth. Areoles: Round, 2 mm diameter at fist woolly soon naked. Radial spines: 18-20, needle-like, often bristly, flexible, 10-14 mm long, yellowish-horn-coloured. *Central spine: 0-1, straight, stright or slightly curved downwards, thick, 14-16 mm long, reddish-brown to dark mahogany, becoming grey. Flowers: funnelform,Pale yellow, 3.5 cm long, 3 cm diameter. Outer perianth segments linear lanceolate, light yellow with green near the tip, and reddish-brown dorsal midstripe.Onner perianth segments linear lanceolate, light yellow. Flaments glassy white, anthers light orange. Style pale green with 5-7 cream-white stigma lobes. *Fruit (berries): Egg-shaped, up to 18 mm long and 8 mm wide, jade-green, succulent, with attached flower remnants. 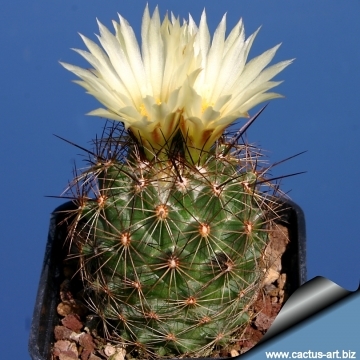 Seeds: 1 x 1.2 mm, brownish, reniform, smooth, shiny, reticulate. Coryphantha magentae: has pink to rich magenta flowers. Distribution: Sierra de la Paila, 1600-2200 m.
Coryphantha pseudoechinus Boed. : has violet-pink flower to 2.5 cm long and about 3 cm broad. Distribution: Coahuila. Coryphantha pseudoechinus subs. laui (L.Bremer) Dicht & A.Lüthy: has yellow flowers and slightly different skin and spination colour. Distribution: Coahuila, Sierra de la Paila. Propagation: Offsets (seldom available) or by seeds.